When The Lady of the House and I originally planned our trip, she wanted to stay in a hotel or motel for one night in Moab. We would have been on the road a couple of days by that time, camping at places with no showers. She figured when we got to Moab, we’d want showers and a real bed to sleep in. She called the hotel where her family had stayed during their visit to the area the previous summer, and the rate was around $250 per night. Yikes! That was way too much! 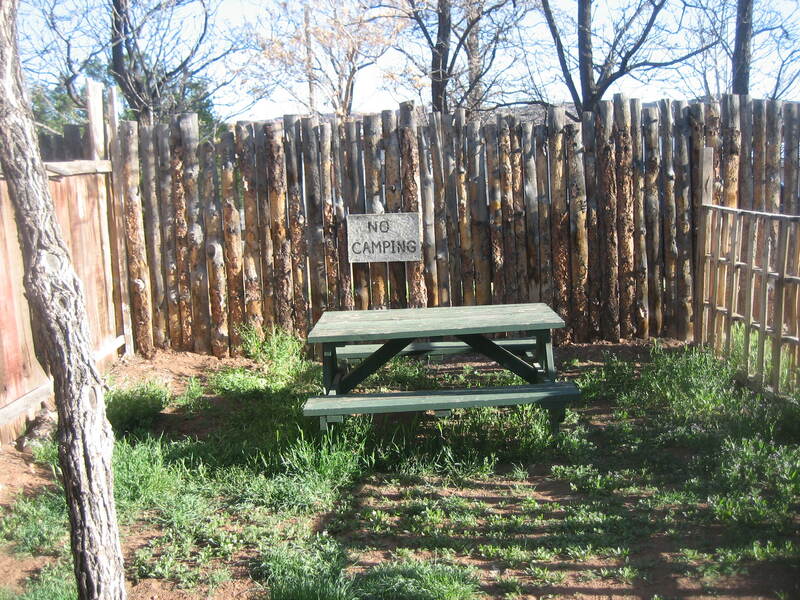 We planned to stay at a hostel in Santa Fe, which made me wonder if Moab had a hostel too. I did a Google Search and found the Lazy Lizard. I knew The Lady was not going to want to stay in the dorm (although those beds are a bargain at just $12 a night). I also knew both the Santa Fe International Hostel in New Mexico’s capital city and the Snow Mansion in Taos offer private rooms. 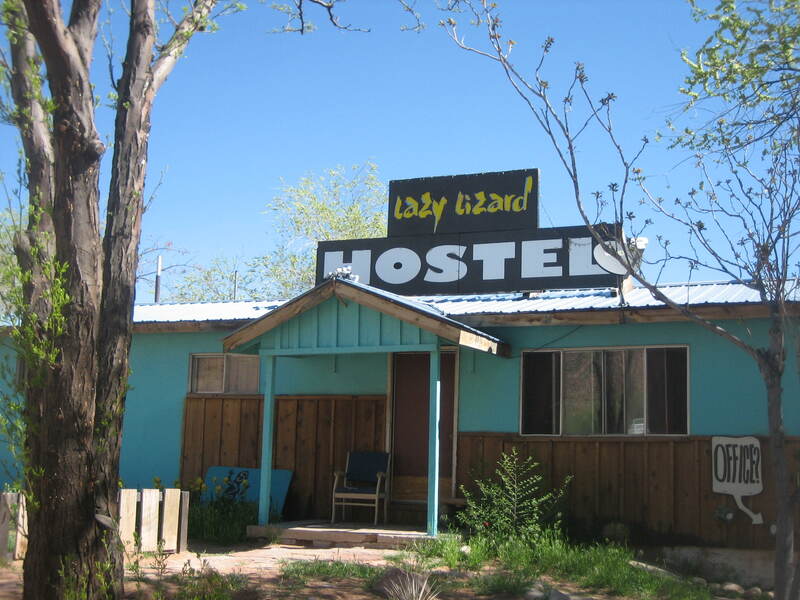 When we looked for private room options on the Lazy Lizard’s website, we found the hostel had cabins available for rent. Let’s get a cabin! The Lady said. I couldn’t argue with her suggestion. Staying in a cabin sounded really fun. Our plans changed because the water pump on my van went out. We never made it to Santa Fe or anywhere else in New Mexico, but we rearranged our Utah itinerary so we could make our reservation at the Lazy Lizard. We left The Needles District of Canyonlands National Park early in the afternoon and drove the couple hours to Moab. 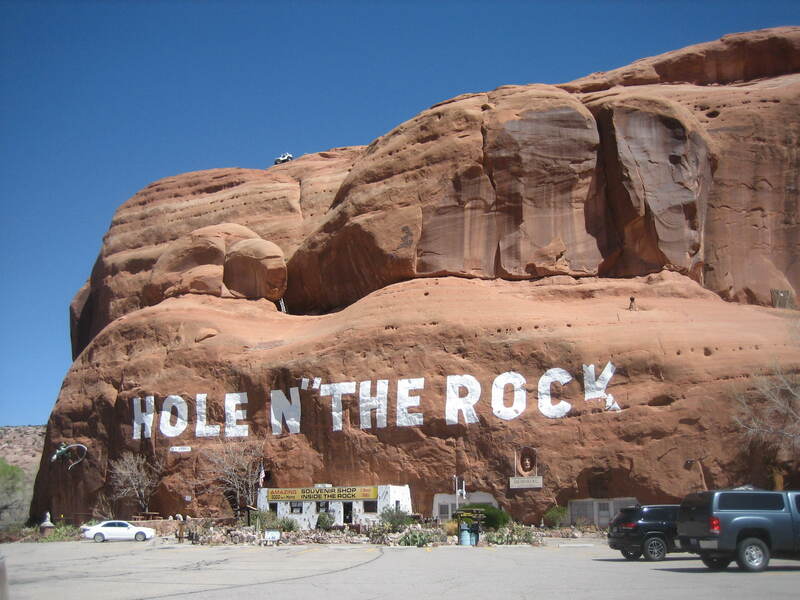 I was excited to see The Hole-N-the Rock tourist attraction outside of town; I’d read a little about it in a Sunset magazine article about the Toilet Paper Hero of Hoover Dam, and it was fun to see it in real life. The Lady and I were hungry, so we decided to eat dinner before we checked in at the hostel. They’ll probably want to show us around, tell us about the shared kitchen, go over the rules, I said about the Lazy Lizard staff. That might take half an hour. Let’s eat dinner first, then we won’t be in a rush to leave again. We had dinner at a place called Pasta Jay’s at 4 S Main Street Moab.The Lady and her family had eaten there during their previous visit to Moab. They’d all enjoyed the food at Pasta Jay’s very much, so much that The Lady wanted to enjoy it again and wanted me to enjoy it too. We arrived at Pasta Jay’s around 4:30, which was great for beating the lunch and dinner crowds. The Lady ordered spaghetti with a meatless red sauce, and I ordered the special artichoke and spinach ravioli in a meatless red sauce. The sauce was so delicious, I would have been content to make a meal by dipping the included garlic bread into the sauce and eating just that. However, the ravioli were tender pillows of perfection that I also enjoyed very much. The portion size was big and if the food had been any less delicious or I had been any less hungry, I would have had leftovers to enjoy later. Since this was some of the best food I’ve ever eaten, there were no leftovers. The Lady ate with gusto what was put in front of her; she didn’t carry out any leftovers either. minutes. The Lady had prepaid with her credit card to hold the reservation, so we didn’t have to wait around to complete a transaction. The fellow who checked us in didn’t mention a single rule, didn’t show us the kitchen or tell us anything about its use, didn’t tell us where we could find the restroom. Thankfully, he did tell us which cabin we’d be staying in (#16) and that we could park next to it. We took our key and went on our way. The cabin was more plain than rustic. There were no decorations of any kind, save for a (much appreciated) mirror. None of the lightbulbs (one in the middle of the ceiling and two in a lamp just inside the door) had a lampshade, which made the room seem harsh. I know we were in budget accommodations, but lampshades and some kind of decor would have helped the cabin seem a little more inviting. In addition to a table and two chairs in the corner and another smaller table near the door, the furniture consisted of a bunk bed. The Lady took the bottom bunk and found the mattress was bigger than the frame. If she got too close to the edge, the side of the mattress drooped towards the floor and she ran the risk of rolling right out of the bed. I slept on the top bunk, which had a double mattress that fit the frame. I found my mattress adequately comfortable, but The Lady said the mattress in my van was more comfortable than the one she slept on in the cabin. Before we started the trip, I’d sent an email to the Lazy Lizard to ask if linens were provided for the beds. I was told they were provided, which was technically true. Both mattresses were covered with a fitted sheet, and a flat sheet was folded on the foot of the bed. A bedspread was folded at the foot of each bed too. The bedspread was a joke. It looked as if it were purchased from a liquidation sale at a Howard Johnson motel that went out of business in the late 80s. It was too thin to do any good against the chill of an April night, so I brought in my comforter from the van. The pillows were flat; fluffing them didn’t help. I brought in my pillow too, as did The Lady. Towels were provided too. There were six fairly fluffy towels for the two of us. However, The Lady found something crusty on the one she was going to use after her shower. She decided to forgo the towels provided and use the one she’d brought from home. The towel I used was free of crust and stains. 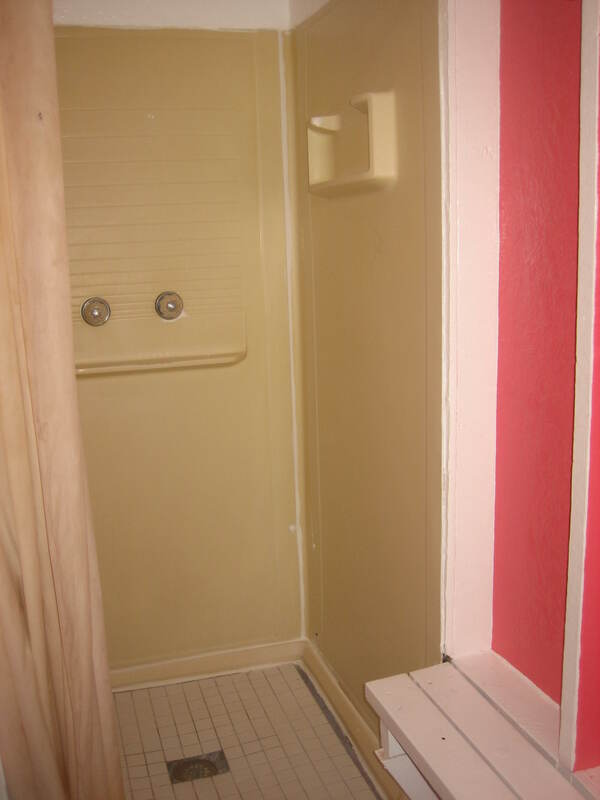 The shower stalls at the Lazy Lizard were narrow and utilitarian, but the water was HOT. We knew when we made the reservation that the cabin didn’t have a private bath. I think everyone at the Lazy Lizard shares the restrooms. 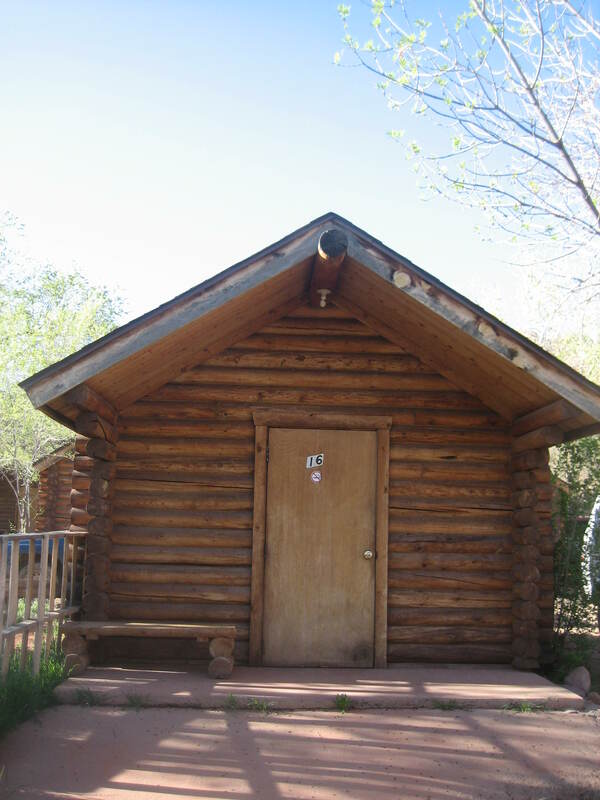 However, I guess in my imagination, our cabin was a little closer to the restrooms than it actually was. In reality, we weren’t terribly far, but it seemed a long walk to get to a toilet at 2am. I think The Lady and I would agree that the highlight of our stay at the Lazy Lizard was the seemingly unlimited hot water in the showers. I was a little afraid the water was going to scald me, but once I got the temperature adjusted properly, I luxuriated in the hot water that never waned. We should have figured out how to use the room’s electric heater before we went to bed. The room was warm enough early in the evening, but got cold in the night. When I came back from the restroom at two in the morning, The Lady told me she was really, really cold. Rather than turn on the light and try to get the heater going, I just went out to the van and got my big down comforter for her. She snuggled down, and we got a few more hours of sleep. The next morning brought its own challenges. The Lady went to check out the cleanliness of the kitchen, but found it was already full of people cooking their breakfasts. The little yard in front of our cabin had a picnic table, so I suggested we set up our camp stove and propane tank and cook there. The Lady was concerned someone would come along and tell us we couldn’t cook outside the cabin. This is the picnic table where The Lady cooked our delicious breakfast. If the man at the desk couldn’t be bothered to tell us how to find the restroom, I told her, I doubt he’s going to come out here and tell us we can’t cook. I set up the tank and the stove, and The Lady cooked. I found out later that she kept catching the dude who had his tent pitched in the little yard next to ours looking at her through the missing board in the wooden fence between the two areas. The Lazy Lizard isn’t a terrible place to stay if you go to Moab and don’t have a rig to sleep in. Just remember, it’s inexpensive housing, and you get what you pay for. 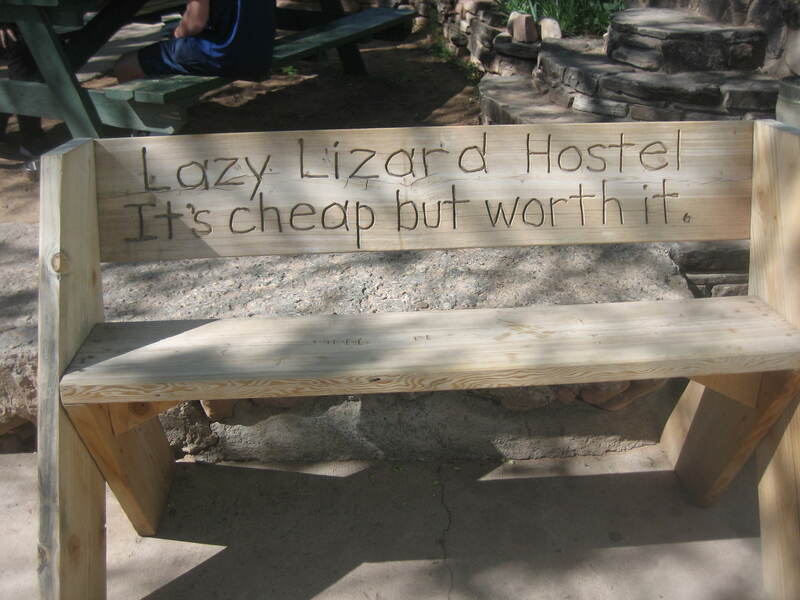 If I went back to Moab alone and without my rig, I’d give the Lazy Lizard’s dormitory a try. If I had my van, I’d stay on nearby free BLM land like Willow Spring Road and pay to shower at the Lazy Lizard. The Lady and I really didn’t spend much time In Moab. The day after our stay at the Lazy Lizard, we spent the afternoon at Arches National Park. That evening we went into Moab to eat dinner on the lovely patio at The Lady’s beloved Atomic Café (located at 1393 North Highway 191) where we had excellent veggie burgers. While we waited for the Atomic Café to open, we walked a bit downtown, pressing pennies at Desert Dreams at 71 N. Main and browsing in the (very expensive) Made in Moab store. However, I enjoyed the vibe of the town—busy but not too crowded, outdoorsy yet artsy too. Maybe there will be more trips to Moab in my future.